Mobvoi recently launched its new high-end smartwatch, the TicWatch Pro. The Chinese brand’s wearable smartwatch is perhaps the most complete Wear OS device on the market, and thanks to its special features, it has managed to win over users and critics. You can read all about the smartwatch in our full review! The Mobvoi TicWatch Pro is available for purchase on Amazon for a price of $249.99 in two colors: black and silver. The price isn’t fantastic if you consider that for 50 dollars more you can get a Gear S3 Frontier from Samsung. The choice in the end is between Wear OS or Tizen. If you choose the Google operating system, you’ll find it difficult to find competitors of the TicWatch Pro that are as elegant and have all the functions for the same time. There are smartwatches made from fine materials from famous brands (like those from Fossil) and there are smartwatches that are older or less equipped. Almost nobody can offer the dual display of TicWatch Pro and very few can compete in price while maintaining the same quality and all the functions. The design of the Mobvoi smartwatch is as simple as it is elegant . The matte plastic case is enclosed between two metal plates: the ring nut and the power part of the watch. The metal frame has numbers, giving the TicWatch Pro a more classic look and that adapts to any situation, from an elegant cocktail night to a weekend of camping and outdoor activities. The plate in contact with the wristband is interrupted only by the contact pins for recharging the watch, along with the heart rate monitor and a small speaker, which I’ll talk about later. The watch is quite large (45mm in diameter, 14mm thick) and is heavy overall, so it’s perhaps more suitable for male users. It looks solid and durable at the same time. I wouldn’t worry about wearing the TicWatch while doing strenuous physical activities, thanks to the excellent construction and IP68 certification against water and dust. So the watch should be able to withstand a few small bumps and sweat. The left side is completely clean while on the right side there are two physical buttons for controlling the clock. The first button on the tops acts as a Home button and opens the list of apps installed on the clock. You can program the second button, but by default it is set to opens the list of sporting activities to be tracked. With a long press you can access the extreme power saving mode described in the battery section. The supplied strap can be replaced quickly thanks to a hook that makes it easier to release. It has an elegant look thanks to the artificial leather finish on the outside, but it’s still comfortable and stable even when you’re exercising thanks to the rubber finish on the inside. It’s a pity that there’s no crown or rotating frame to facilitate interactions with Wear OS, which would have been really fantastic. The TicWatch Pro uses two different types of displays . You read that right, this watch has two screens. The main display is a 1.39” AMOLED with a resolution of 400x400 pixels and is used to show Wear OS and all the various possible color content from apps and notifications. So what about the second display? It’s positioned above the main display, and the monochrome FSTN display is completely transparent and gives you a perfect look to the AMOLED panel below. When the main display is turned off, the second display is turned on and displays the time, date, the number of steps you’ve walked and the battery level. This allows the TicWatch to display this information at any time with no impact on battery consumption and is reminiscent of the classic displays of non-smart digital watches. It’s not the first watch to use this solution, since some Casios already have this dual display, but for the first time this implementation is used in an elegant watch and isn’t necessarily focused on extreme physical or outdoor activities. Both displays are perfectly visible in sunlight: the main display (the AMOLED panel) is bright enough for sunny days, and the second is also quite visible. Unfortunately, the monochrome display doesn’t have a backlight, so it’s necessary to activate the AMOLED display to read the time in the dark. When you use the liquid crystal panel, you can’t really read it. From a certain point of view, the TicWatch Pro has some advantages, but at the same time the software represents one of the smartwatch’s major weaknesses. Wear OS works, since it allows you to do much more than just tasks thanks to the thousands of apps that can be downloaded from the Google Play Store, but it’s not really pleasant to use. All in all, Wear OS allows you to download thousands and thousands of apps for your watch and this is certainly an advantage over a proprietary operating system that wouldn’t be able to get you very far. Wear OS comes in Version 1.4 based on Android 8.0 Oreo. The technical specifications of the watch aren't far from the Wear OS smartwatches in recent years: Qualcomm Snapdragon Wear 2100, 512MB RAM, 4GB internal memory for app installation and music downloads, Bluetooth 4.2 LE and WIFI 802.11 b/g/n at 2.4GHz. The hardware is more than enough to run the TicWatch flawlessly, but there is no real innovation in the technology. There’s a lack of a new, more powerful or more efficient clip made exclusively for wearables, but that’s not necessarily Mobvoi’s fault. The Ticwatch Pro has the best hardware on the market including a GPS chip for distance tracking even without a smartphone, an NFC chip for payments via Google Pay and a heart rate reader. Put all this together with the dual display and long battery life and you’ll get the most complete Wear OS device on the market. On the right side of the watch, you’ll find the main microphone exactly halfway between the two keys. This microphone is responsible for listening to all your requests to Google Assistant and allows you to make phone calls via the smartphone’s SIM without ever having to take your phone out of your pocket. Thanks to the integrated speaker, Google Assistant functions well. The speaker has enough volume to listen to your assistant’s various responses and make phone calls , but don’t expect to enjoy high enough audio quality for music (although technically it’s possible to listen to music from the speaker). The battery is 415 mAh, a fairly standard value for recent smartwatches. However, Mobvoi has succeeded in what many manufacturers have been failing to do for some time now: the TicWatch Pro has a battery life of more than two full days . This is achieved by using a special power-saving mode that turns off the main display of the TicWatch Pro while keeping only the super efficient secondary LCD active when the smartwatch isn’t in use. This saves a lot of battery power throughout the day and can easily exceed two days of use. You can also completely turn off the hardware needed by Wear OS to run and use only a reduced version of the watch that still includes a pedometer and heart rate monitor. This will guarantee a battery life of up to 30 days. This is called Mobvoi Essential mode and can be very useful if you have to spend an entire weekend away from home and don’t want to take the TicWatch charger with you. Yes, the TicWatch Pro once again uses a proprietary magnetic charging base with metal pins for charging. Obviously, the USB cable is soldered to the base and isn’t replaceable, and luckily the magnets are much stronger and more useful than the magnets I’ve had the chance to try on the TicWatch E and S. The charger doesn’t charge the smartwatch quickly, but it’s not a problem since you’ll never need to recharge the watch before nightfall. The TicWatch Pro isn’t the precious watch that many would want on their wrist. For sporty and less pretentious people like me, however, the smartwatch could be the best choice on the market. The design is elegant and the materials are solid enough to ensure good resistance during physical exercise. The dual display is a great idea that I’d like to see on more and more wearables and helps prolong the battery life. The ability to continue to use the TicWatch even with “low battery” in its reduced mode is the real trick up Mobvoi’s sleeve. Not only that, but the presence of WIFI, NFC, GPS and the heart rate monitor allows you to use the TicWatch even during physical activities where bringing a smartphone isn’t convenient. It’s just a shame that there’s no LTE version. 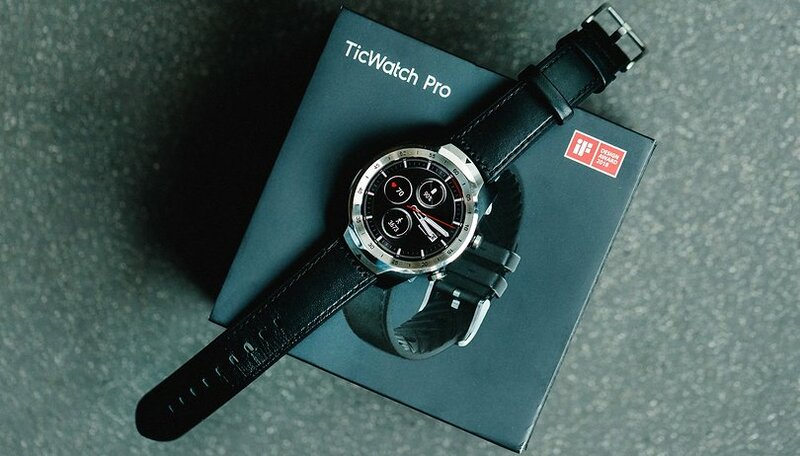 If you consider the high launch price, many people will likely choose a more elegant smartwatch at the same price, but if you’re looking more for a smartwatch with features rather than aesthetics, the TicWatch Pro is a complete device. What do you think of the TicWatch Pro? Is there a smartwatch that you’d prefer?